Amandari is located in the village of Kedewatan about 60 minutes from the international airport at Denpasar and just 10 minutes from the arts community of Ubud in Central Bali. Perched on an escarpment high above the winding Ayung River gorge, it follows the design of a traditional Balinese village which provides a unique setting from which to experience the cultural richness of Bali’s artistic centre as well as its mountainous region to the north. 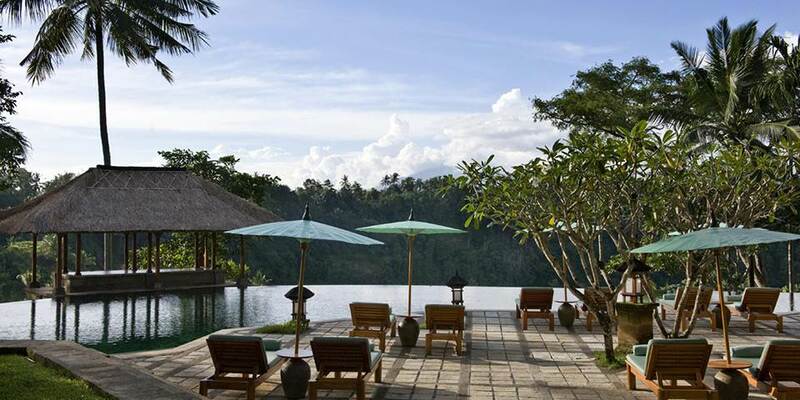 Dining at Amandari takes place at the open-air Restaurant, crafted largely of teak, which overlooks the swimming pool and the Ayung Valley, with Western and local Indonesian dishes served for breakfast, lunch and dinner. The adjacent Bar, with its terrace seating, enjoys a similar setting and views. The guides at Amandari have a thorough knowledge of the island and can tailor personal excursions to any part of Bali, perhaps to see temple monuments and rice terraces, or woodcarvings in the villages of Tegallang and Jati and the wealth of arts, crafts and painters’ studios in Ubud; maybe have a piece of jewellery custom made by the craftsmen in the village of Celuk. Take the exhilarating way to appreciate the beauty of Bali by following a trail through the countryside on foot or by bicycle or experience the thrill of white water rafting down the Ayung River. After a day exploring the island there is much to experience back at Amandari, maybe relax by the swimming pool, read a book in the library, play a game of tennis or have an energetic work out in the gym. Those seeking a more relaxing interlude should visit Amandari’s luxury spa which features two open air bales, surrounded by a lotus pond and which seem to float above the water.The spa offers a selection of wellness and beauty treatments, including massages and scrubs which use the local Balinese ingredients, chosen for their soothing and healing properties. Coconut wood and teak is used throughout all of the 30 freestanding thatched roof suites which are divided into Village, Valley and Pool Suite categories. All have a living area from which sliding glass doors open to the lush surroundings of a garden courtyard. Some are single story and others are duplex with the bed on a mezzanine level. Luxurious bathrooms feature outdoor sunken marble baths which are walled but completely open to the sky. Pool suites have the added benefit of their own private plunge pool. The Asmara and Ayung Suites are duplexes with large private swimming pools and views of the rice terraces and valley below. 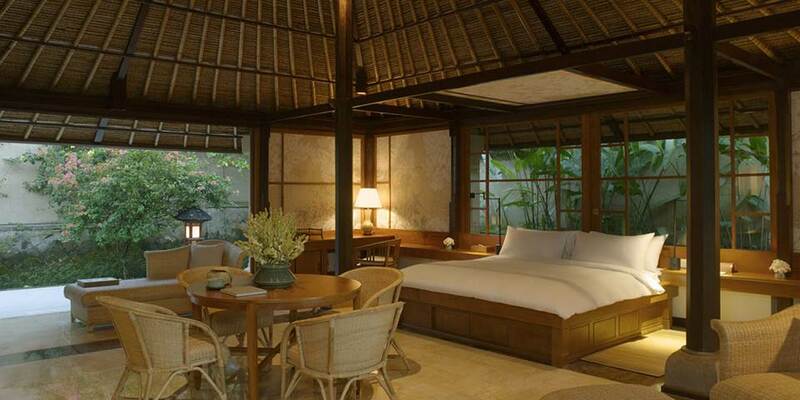 The Amandari Suite offers one or two detached bedrooms along with a separate living room pavilion. An outdoor dining bale of teak and bamboo is set within its spacious tropical garden and picturesque views of the surrounding area may be enjoyed from the suite’s private swimming pool. 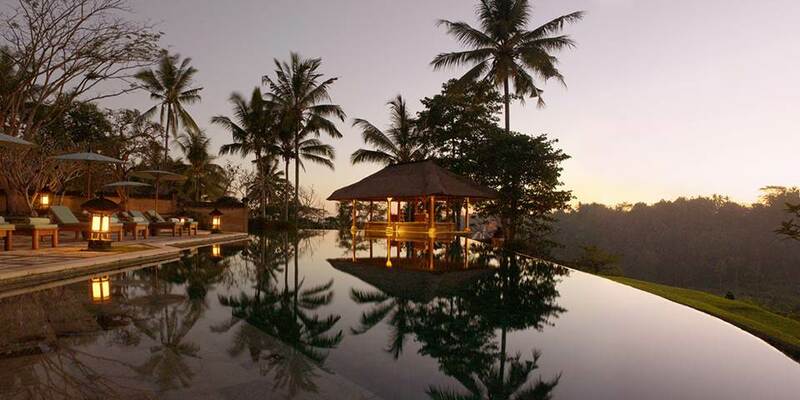 For absolute seclusion and luxury the Amandari Villa is nestled in rice terraces less than a minute’s drive from the resort. 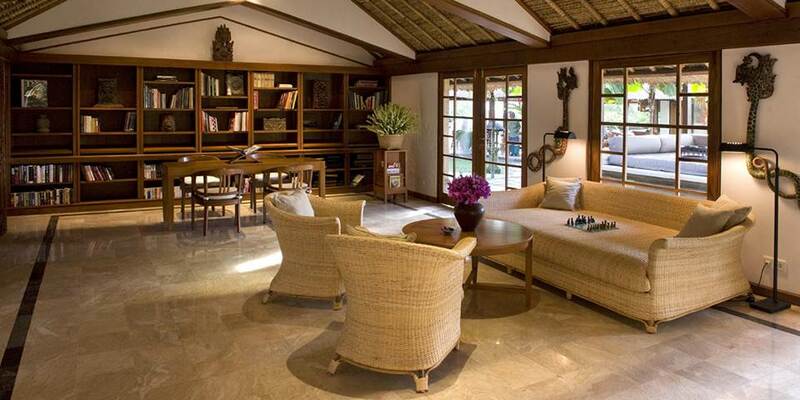 The five pavilions provide three bedrooms, a living room entirely walled in windows and a fully fitted kitchen. A garden and landscaped deck embrace an expansive two tiered swimming pool. A staff of two looks after guests, who may also take advantage of the facilities of the resort.